Homes and workplaces alike need the best lockbox for keys that you can get. Whether you’re controlling access to a wide range of different keys or just need a safe place to store them all, a lock box for keys is a vital piece of equipment. In this article, we will take a closer look at the best options available on the market today. 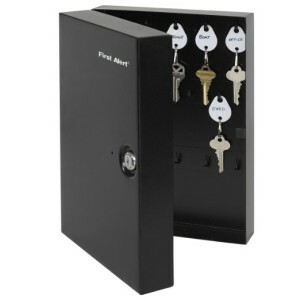 The First Alert 3060F Steel Key Cabinet is an excellent choice for storing keys as well as organizing them. For easy access and identification, the interior of this lockbox for keys features 28 key hangers and 28 key tags for each individual key. Besides getting key tags, you will also get all of the mounting hardware needed for securing it to a wall. The cabinet is also fitted with a security lock that comes with two keys. If you’re looking for a way to store your keys with complete confidence the First Alert 3060F Steel Key Box is an excellent choice. With First Alert, you can rest assure that you will get a safe with great innovation, quality and finesse and that has been made with the customers needs in mind. High-quality steel construction with powder coating for a durable finish. The high quality light steel used in the manufacture of this key cabinet means that it is not bulky but certainly built to last. 2 keys are provided to enter the strong key lock. Mounting hardware for securing on wall is included as well as key tags is a huge plus for reviewers of this product. Each unit contains 28 key hangers and 28 key tags for organizing the keys. The Kidde AccessPoint Combination Key safe is made out of heavy-duty steel for a better protection of your keys. The combination lock features over a thousand combinations that can be reset. A pushbutton lock gives easy access with extra security and convenience. The key lock box measures a mere 8 x 2 x 12 inches and can store up to 30 keys. The key safe box also has a depth for bigger key rings so there is no need to detach keys from their rings to fit them inside the safe. The heavy-duty steel combination key lockbox includes hardware for easy mounting. This unit is also fitted with a unique clutch mechanism that protects your keys from forced entry. A continuous piano hinge holds the door in line with the rest of the cabinet meaning this unit is built to last many years to come. Made from 16-gauge heavy-duty steel making it one of the most secure places to store your keys. 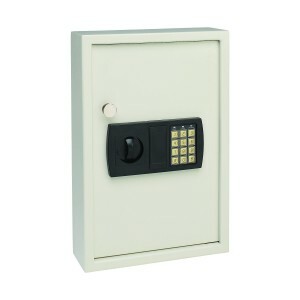 The key lockbox also has a larger depth means you can fit more than most other key safes. The combination lock that features over a 1,000 combinations. Combinations can be easily reset if required. It also comes with a unique clutch mechanism that protects your keys from forced entry. Screw and wall anchors required for easy mounting and setup included. Comfortably fits up to 30 keys. There is also added depth for keys on larger rings. Enjoy the convenience and security of storing and accessing your keys with the heavy-duty and ultra-reliable combi-cam lock. This unit offers more than 1,000 combinations, allowing you to set your own secure code. With this key cabinet, you completely avoid the hassle of having to manage extra keys to access even more keys. The KeyGuard Combination Key Safe is a heavy-duty 16 gauge steel construction which make it extremely durable and reliable as a key cabinet. It features steel hooks and a continuous piano hinge, so there are no plastic pieces that can be broken off causing the unit to fall apart. It has a capacity of 48 hooks and its heavy gauge steel body shows that its built to last. Mounting hardware is included to make installation and access to your key safe as easy as possible. To make your life even more simple key tags are included to help with organization of your keys. The KeyGuard SL-8548 Combination Key Cabinet with Black 3-Dial Combi-Cam is constructed from heavy-duty 16 gauge steel with a stunning black finish. Add to that a continuous piano hinge and steel hooks and you get a truly durable and reliable product. 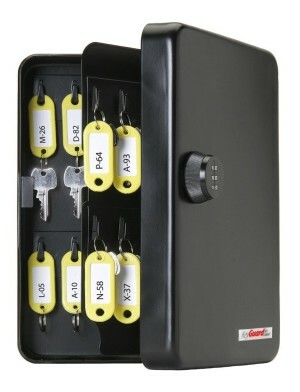 This key cabinet allows you to safely and securely store 48 keys. A keyless combi-cam lock with up to 1,000 combinations. The Code can easily be reset and also be set to a non-resettable mode for better security. 24 keys tags included in each of the colors blue, black, red and yellow that makes it easy to organize. MMF Industries – which is the creator of this key lockbox – is a leading manufacturer when it comes to bank and office products and have been so for over 50 years. 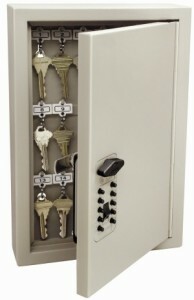 The Steelmaster Key Cabinet is perfect for you who seek to keep your keys organized and safe. In the case of battery failure, this key lockbox also has a faceplate that can be removed to reveal a key lock you can unlock with the backup key. This key safe also happens to be very robust with the heavy-duty steel construction which offers long-lasting protection. It is simply one of the best lockboxes for keys that you can find because it’s made of heavy-duty steel material that’s built to last. A hassle-free entry with the electronic keypad that saves you from duplicating keys to open your key storage cabinet while providing a removable faceplate that hides a backup key lock in case of battery failure. Key entry as a backup if the battery fails.